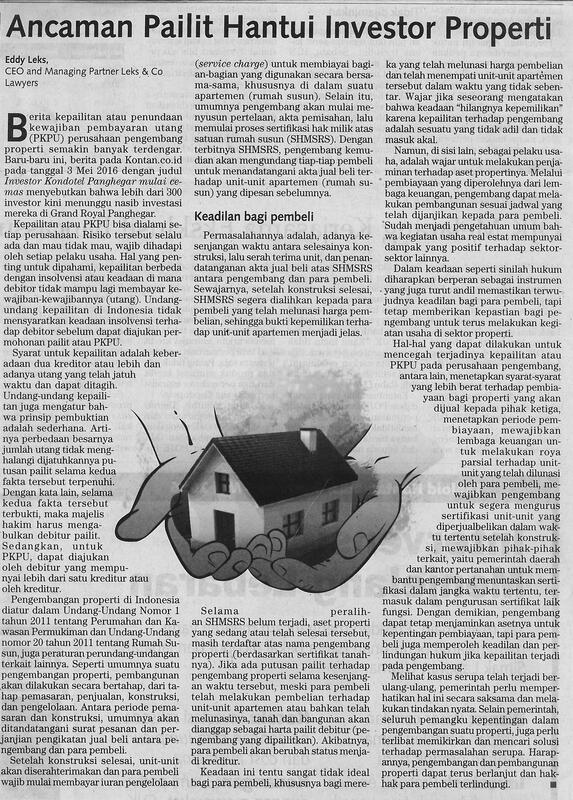 I wrote an article recently, and published in KONTAN daily newspaper on 12 May 2016, with a title "Bankruptcy Threat Haunts Real Estate Investors" (Ancaman Pailit Hantui Investor Properti). The article speaks about the real and current threat that is inherent in every primary real estate development. The buyer in primary market, since the real estate is under development, has not obtained certificate of ownership over the condominium unit that is going to be bought. This results on legal risk, when the developer goes bankrupt, all assets will be seized by the receiver since the land is still registered under developer's name (visit our offices to find out details). What happens recently to a developer in Bandung is not new. Many had experienced the same events. The situation is bad for a developer and especially for the real estate buyer/investors. Therefore, this articles calls more attention by the government, to supervise the real estate development, its financing, its sale to customers, and more rigid approach to be taken to ensure legal protection to real estate investors. Please read below article or visit this link.